The rut is tailing off, gun seasons are rolling across the country and big bucks are falling. Here though, we may just have our biggest buck of the year. 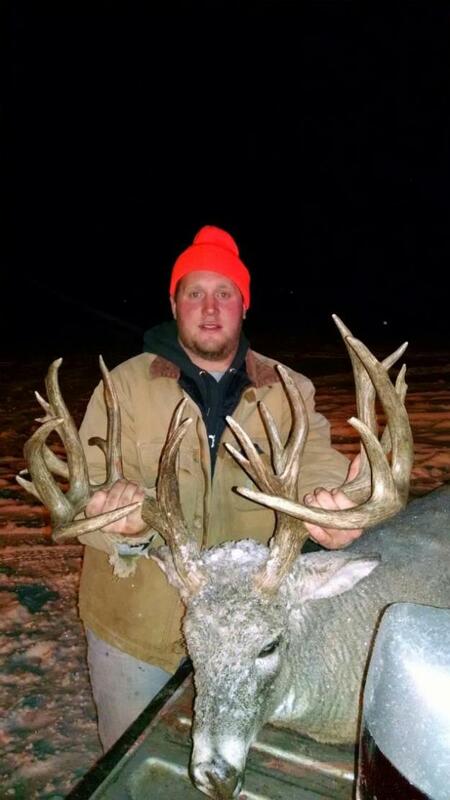 Clayton Sohler from Platte, South Dakota shot this amazing, monster buck on November 15 in South Dakota. The buck has bee scored at 240 inches non-typical, and sports a 10 point main frame with a whole bunch of stickers. Clayton had a great hunt and a great story, click through to learn more. On the evening of November 15th, Clayton was hunting in a blind in on some relatives property. Right before dark, this big buck stepped out and Clayton knew that it was a shooter. Even with 35 mile per hour winds and sub-zero temperatures, Clayton put a great shot on the buck. The buck dropped and Clayton took off after it to see what he got! “When I got to the buck I just stood there in awe. Then I looked back and saw Carly 200 yards away coming behind me, so I went back and got her. I wish we had taken better pictures but it was so cold and getting dark, so we just got it out of there,” Clayton said. The buck has been scored by three people who all got scores within a half inch of 240 inches as a non-typical. The frame is very symmetrical and tapes out at 194 4/8 before adding in the non-typical points. Earlier that morning, Clayton’s sister saw the deer but couldn’t get a shot. Now the buck will hang proudly on that family’s wall. Congratulations Clayton on the buck of a lifetime! See more big buck photos and the latest outdoor news.